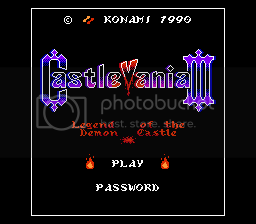 [FINISHED] Castlevania 3 (Jap Rom) Title Screen WIP - HELP WANTED! 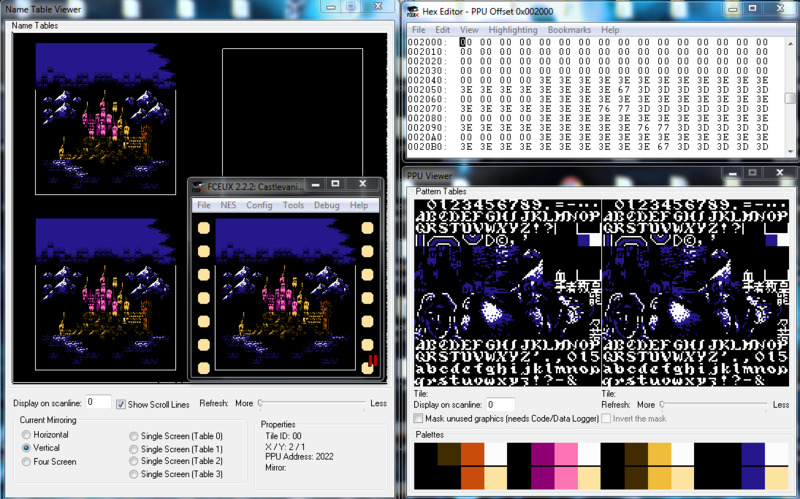 Re: Castlevania 3 (Jap Rom) Title Screen WIP - HELP WANTED! Well, after some thinking I decided to leave the upper Konami part as it was in my last pic, and just put the trademark, copyright logo and year in between the title and the selections. That's it for the Title Screen! Re: [FINISHED] Castlevania 3 (Jap Rom) Title Screen WIP - HELP WANTED! I'll fiddle around with it a bit myself and then if you like the result you can release it as 2.1. I noticed that in the introduction sequence, the Konami logo and the subtitle had different palettes. Seems like the game has two different palettes for both the Main Title Screen and the Title screen showed in the intro sequence. Yeah. I should have mentioned that earlier. I seem to remember some differences in the tile mapping as well due how the animation was executed. This version fixes a LOT of issues that were carried over from Vice Translations' translation project. Mostly, some issues with the ending sequence and credits. Also, the Main Title Screen, the one for the introdution sequence and the ending sequence now all have the same tiles and custom palette, and I took the effort to change the font of the subtitle screen to match that of the ending sequence. I am quite happy how this turned out to be. User Proveaux worked further into the v2.1 of the hack and has come closer to what Vanya had in mind for the Title Screen. I will try to look into this hack to try to implement it to v3.0, although that might take a while to see what parts have been changed and so on. You may be able to patch right on to the 3.0 If we didn't change any of the same data. I will look into tonight if I don't see where you have had a chance by then. Excellent! The blood splatter is even in the position I originally wanted before I had to compromise in my mock up. Vanya, I think you migh be interested in the v2.1 of Proveaux hack, since that one uses two tiles of height (16x8) and v3.0 only uses one (8x8) for the subtitle. This is because I changed the font of the subtitle to capital letters used in the game (like the ones in the credits) instead of the custom font I made for the subtitle. Edit it to your liking and let us know how that worked! I actually used his patch over the 3.0 patch. I had some trouble downloading it until I right clicked and opened in another tab at which point it opened the dropbox download page and I got it directly from there. I am wondering, though, if that would have affected any of the additional fixes you made? I changed the way the border graphics are set up some some of the other borders got slightly borked. The fixes were mostly done to text location and localization of names and other stuff. Although, I don't know if this changes affect the other title screens in the game, as those same sprites are loaded in the introduction sequence and the ending but with different palettes. Try a password to get to Dracula and complete the game to verify. You guys wouldn't know by any chance how to make this happen would you? Right now I replaced the Sprite area with the Logo but its all over the place completely scrambled mess. Exactly what kind of mess are you getting? That might have to do with the animated tiles that make the fog effect, I could be wrong though. How did you edit the tiles for the castle? I'm actually editing the USA Version where the Clouds don't move. I cleared the image fairly easily. It's that I don't know how to permanently edit the Hex Values in the ROM, I can only edit the PPU VRAM Viewer which seems to only be temporary until the game is reset, Then it goes back to the original image. Here you can see the image was imported successfully but the game itself still thinks the old image is in place. I did manage to get the Konami Logo in the center of the screen perfectly after cleaning it up. However it was only a temporary fix because as you can see in the image below I used the PPU Editor. Which isn't permanent. Or at least there was no save option available. So once I clicked Reset, The original mess was loaded again. Well first off you're going to need the original tiles put back to search it in the ROM. Once you have them back, go to that screen again and open the PPU Viewer. Pause the emulator here and try to match tiles with the full image. In the PPU Viewer you'll see the separate tiles, each one with a Unique Tile ID, simply write down the ID of the tiles and in which order they are being written in the screen from upper left to right. 01, 02, 03, 04, then the ones from the tip of the castle. 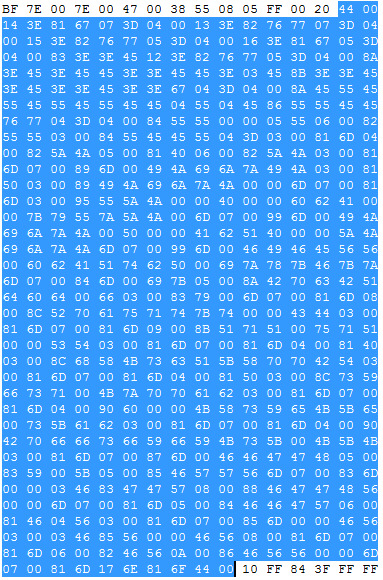 It's just a mwtter of knowing what each tile ID is and searching those values in the order they are in the screen in the ROMs data. So according to the doc, looking at PPU offset $2000 will give us the name table (bg tile map is stored here in this case). However, searching for those exact values turns up nothing in the ROM. So now what? I remember there is a value that defines a single tile to draw, one that defines a series of tiles to draw, and one that defines specific arrangement of tiles. You'll have to do a little trial and error to figure it. I apparently forgot to write that info down. With that bit of info, we know the game uses some type of RLE compression/control codes. Looking again at PPU offset $2000, we see the name table starts off with a bunch of $00s and $3Es. Counting the $00s we get 68 ($44), and for the $3Es we get 20 ($14). So now let's try searching the ROM now for $4400 followed by $143E. We get 1 result at $32D8E, and it is indeed the name table! The attribute table is followed immediately after as well. Now you just need to edit it (remember to pay attention to the control codes!). ROMs don't have chips and I got it to work just fine on my Powerpak.